in language, which brings you to me. Jen McClanaghan's poems are quietly astonishing, and few first collections display such a self-assured control of tone. Her writing is reflective but tough-minded, filled with self-reckonings but shorn of self-pity, and fearless in its ability to mix the lyric sublime with a solid measure of the absurd. 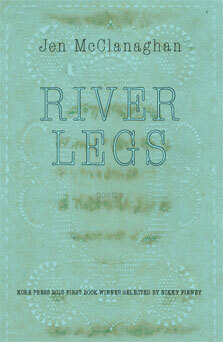 River Legs is a powerful and haunting debut. How generous these poems are! And how we need them—at a time in history when hearts are often weighed and sold like lobsters, Jen McClanaghan offers beauty where there was ugliness but a moment before, music within discord, a caress instead of a blow, the warmth of a hearth in a cold world, tenderness in a stony one. Let beauty in, she says, have faith in words, and offer your hand—the right person will take it. For the past several years, Jen McClanaghan has been, among her generation of young poets, one of my must-read favorites and now, with the publication of her debut collection, River Legs, her full-voiced arrival on the national scene feels like a triumph for those of us who swear allegiance to the vitality of American poetry. The mark of a truly imaginative poet is to say what we human beings all feel in a way that's never been said before. That's what happens in River Legs. Beautiful work! Tender. Gutsy. Full of treasured phrases and wonderings. The poet never gives up until all the pieces of the poem come together. She builds such a strong path with the surprise of language until we leave our predictable worlds behind—completely trusting each and every step.